A single seared shrimp sat atop a scoop of mashed avocado with a healthy pile of salty black specks overflowing onto the plate beside it. If I didn’t already know what I had gotten myself into, I would have been certain the topping was caviar—each spot popped just like a sturgeon egg might have. But rather than fishiness came an alien citrus flavor unlike any meat I’d ever tasted. After all, I was eating black ants. 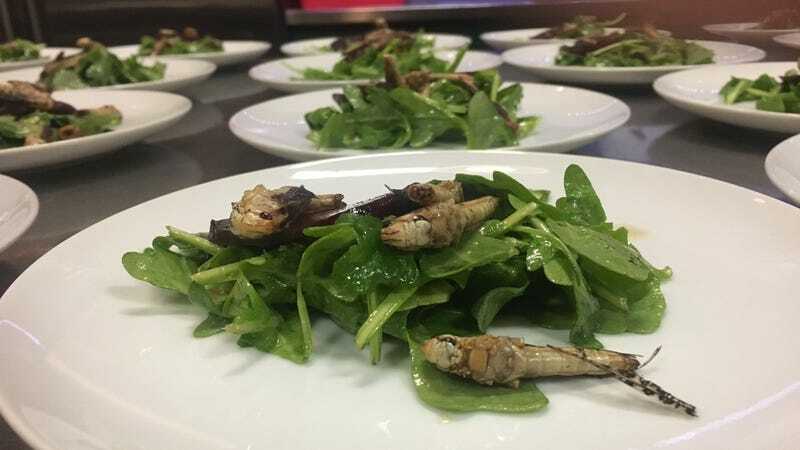 “They increase sexual vigor,” author and chef David George Gordon told the crowd of 40 at the Bug Banquet of the Brooklyn Bugs festival, New York’s first festival devoted to eating insects (He’s probably not wrong). Brooklyn Bugs filled Labor Day weekend with events, from an outdoor market to the haute ten-course tasting menu at the Brooklyn Kitchen. The festival was the brainchild of Chef Joseph Yoon, who normally runs dinner parties and tasting events. Yoon was only introduced to entomophagy, or bug eating, six months ago. The cadre of insect farmers and purveyors selling a human-grade product were excited with what he was doing, and after putting out feelers, he organized the festival in just three months. “There’s never been an edible insects festival in New York City,” Yoon told Gizmodo, so he took it upon himself to shine a spotlight on the work these vendors have been doing for years. His reason for starting the festival, first and foremost, was culinary. The festival kicked off with a day of meals, tastings and lectures on the science, culture, history, and psychology of eating bugs. An outdoor market day followed where vendors hawked products like cricket protein powders, mealworm bolognese sauce and seasoned chapulines, a Central American grasshopper whose taste and texture had everything in common with a dried goji berry. But why eat bugs? Like Yoon, some of the vendors were interested in Americans overcoming a culinary fear that’s mainly cultural. Mexican and Korean cuisine both have dishes reliant on insects like ants or silkworm pupae, for example. Most insect food producers cited the same reasons as others working on futuristic protein options, like cultured or plant-based meat substitutes. Some reports suggest that eating insects could reduce the energy and water burden of modern industrial agriculture. These entrepreneurs would like to restructure already unsustainable food systems in order to feed the world’s fast-growing population, all while reducing greenhouse gas emissions. None of the folks I spoke to were otherwise vegetarian or vegan, though many try to reduce their meat consumption. “Entorian” is the word they used to describe their bug-eating identity. “I don’t think any one thing will save the world,” Robyn Shapiro, co-founder of Seek Food, told Gizmodo. “Consumers should have a choice.” She tries to ease consumers into the idea of eating bugs by producing products like cricket-flower granola, which I thought tasted better than most insect-less granola. And unlike plant-based proteins and lab-grown meats, bugs already exist as a food option. “People get excited about things that are different, but let’s look at the resources we have,” she said. At the main event, Gordon and Yoon served a party of forty VIPs, mostly insect farmers and food producers as well as other interested novices, in the rustic Brooklyn Kitchen space. The first dish, a June bug fritter passed as an appetizer, would not help any hesitant consumer overcome their fear. Peeling away the batter revealed the entire inch-long bug, legs and all. It tasted powerfully salty and meaty, with a texture like filling a shrimp shell with pate. Exoskeletons in our teeth was something my partner and I would have to get used to throughout the meal. The bottomless wine helped. Nine other dishes featuring nine other bugs followed. Each was carefully constructed to highlight each insect’s subtle flavors, as different from one another as chicken from steak. Locust tasted like a less sweet, wetter corn. My neighbors decided this dish required the supplied chopsticks, rather than a fork or a knife. Scorpion, served stinger and all, was intensely salty with a bit of bite. The stinger caused some concern, but Gordon reminded us that the cooking denatures the venom, and as far as I know, everyone survived the meal. Water bug, any urban apartment dweller’s nightmare, hinted of green apple. As serious as the dishes were, there was little deconstruction of the bugs. Aside for the black ants and the bundaegi, silkworm pupae prepared in rice with beef short-rib that snapped like little sausages, everything pretty much just looked like a full bug sitting on top of something else, which caused reactions varying from disgust to laughter. As participants were seasoned entorians, each new dish felt more X-Factor than Fear Factor. Each dish came with an explanation by Gordon about the culture and history of its featured invertebrate; we even received a quick guest lecture from Louis Sorkin, American Museum of Natural History entomologist. He spoke about Vespula flaviceps, a relative of the yellow jacket. This dish was the only one I found too buggy, somehow. By the end of the meal, chefs, vendors and sponsors drunkenly congratulated themselves, the guests, and the hosts, who felt as if they were truly a part of an important moment in the history of future food. Many hurdles remain before American consumers accept bugs as a normal source of protein, of course. Multiple vendors discussed the high costs—there’s little demand and few farms, so many bug products still command luxury prices. Others are trying to use science to overcome the yuck factor. Canadian food scientist Lee Cadesky at C-fu foods is working on ways to isolate the bug protein, to create something closer in texture to grainy tofu. Will the movement take off? I am unsure the average meat eater will ever be okay munching the biggest hornet I have ever seen, and insect protein tofu burgers sound a bit dystopian. But this is only the beginning, and you can be sure that these chefs, entrepreneurs and entorians will keep working until you’re okay with crickets in your cookies.